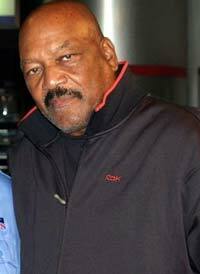 Jim Brown is an American former professional football player and actor. He is popular for the great record-setting 9 year career as a running back for National Football League’s Cleveland Browns. In the year 2002, Sporting News named him the greatest professional football player ever. Jim is considered by many as one of the greatest professional athletes America has ever produced. Jim Brown was born on February 17th, 1936 in Georgia. He experienced a childhood full of many challenges; his father abandoned their family when he was just 2 weeks old and after a while his mother left to work as a maid in Manhasset, New York. Jim lived with his great grandmother until he was 8. He joined his mother in New York where he went to Manhasset High School. In this school, he thrived in the field of football. In his senior year, the young running back averaged an amazing 14.9 yards per carry. This was more than enough to earn him a place at Syracuse University. In college Jim dominated the completion, for both football and basketball. He was also a talented lacrosse player. Brown ended his final game in college by rushing for 197 yards, scoring 6 touchdowns and kicking 7 extra points. Jim Brown joined the Cleveland Browns in the first round of the 1956 draft. He departed as the NFL record holder for career rushing yards (12,312) and single season rushing yards (1,863). He was also the all-time leader in the rushing touchdowns, total touchdowns and all-purpose yards. Jim was the first ever player to reach the 100 rushing touchdowns milestone. His record of scoring 100 touchdowns in just 93 games stood until LaDainian Tomlinson broke it by doing it in 89 games during the 2006 season. Brown holds the record for total seasons leading the NFL in all-purpose yards (5: 1958-1961 and 1964). He is also the only rusher in NFL history to have an average of over 100 yards for each game for their entire career. Out of the backfield, Jim was also a great receiver, catching 262 passes for 20 touchdowns and 2,499 yards. In each and every season he played, Jim was voted to the Pro Bowl. The most amazing thing about Brown is that he accomplished all these records despite never playing past 29 years of age. His 6 games with at least 4 touchdowns still remain an NFL record. Brown retired from football after 9 seasons. He is still the Cleveland Browns all-time leading rusher. Jim Brown started acting before the 1964 season. He acted as a Buffalo Soldier in action film called “Rio Conchos.” This film premiered at Cleveland’s Hippodrome theatre on October 23rd. In 1966, he shot his second film, “The Dirty Dozen.” In 1967, he played a villain in an episode of “I Spy” called “Cops and Robbers.” He also appeared in the 1970 movie called “tick…tick…tick…” and many other films. Later in the 1980’s he acted in films like “The Running Man,” “Any Given Sunday,” “Mars Attack” and “Sucker Free City.” He also appeared in some TV shows such as “Knight Rider” and “The A-Team” where he appeared alongside another football hero Joe Namath. As of 2008, Jim Brown was serving as an Executive Advisor to Cleveland Browns. Here, he builds relationships with team’s players and also enhances the NFL’s sponsored programs through the team’s player programs department.